Sonny's Super Stop Exxon at 111 Pan American Drive in Livingston sold a $1,000,000 dollar scratch off Texas Lottery Ticket on December 2. Livingston Man Wins 1 Million Bucks With Scratch Off Ticket, LIVINGSTON, December 4, 2015 - On December 2, 2015, a man who is a resident of Livingston walked into to Sonny's Super Stop Exxon located at 111 Pan American Drive in Livingston and by chance, bought a $1,000,000 dollar Texas Lottery scratch off ticket. The man (understandably) asked not to be identified. Store clerk, Tina, sold the man the ticket. According to Tina, the gentleman called back about 30 minutes later and announced to her that he had won a million dollars. Tina stated that the man was very happy. PolkCountyToday.com spoke to the man and asked him to do an interview, but he kindly asked not to because he just wants to enjoy his winnings and spend his time with his wife in privacy. This isn't the first time a Livingston man has won a million dollars. Back in the early 90s, local business owner, David Cunningham also won a million dollars in the Texas Lottery. Store clerks, Tina (left) and Kayla are always smiling and ready to help customers at Sonny's Exxon. 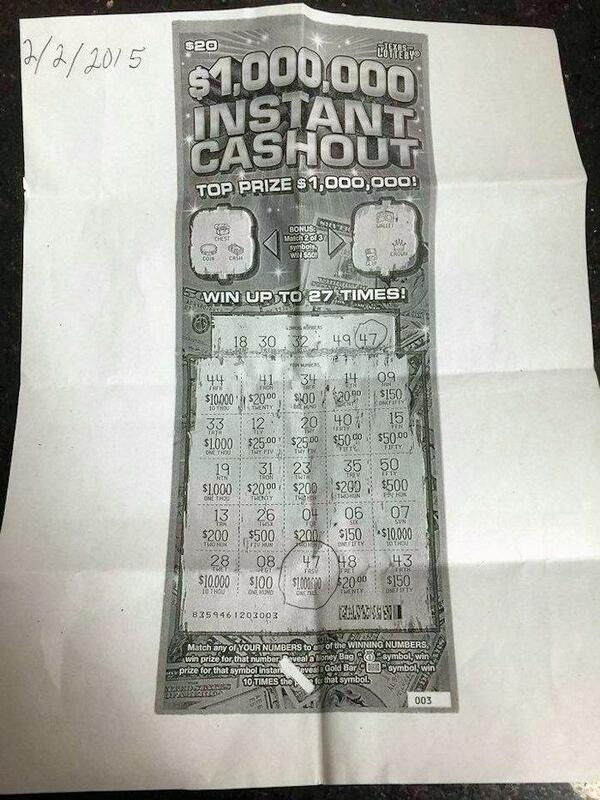 Photo copy of the winning $1,000,000 ticket.